PEANUT, WHEAT, CORN starch, sugar, palm oil, salt, seaweed, wasabi powder (maltodextrin, horseradish, MUSTARD oil), Colours: E140. May contain traces of SOY and SESAME. Almost a classic in the global snack culture, our WASABI PEANUTS apply with their sharp appearance among the friends of Japanese horseradish as an absolutely intensified snack with peanut center to die for. 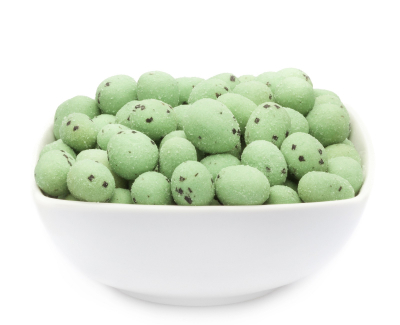 The sharp wasabi crust that surrounds the fine peanuts crisp is, with its beautiful dark green colour and the small black spots from seaweed are more than just real a eye-catcher, which makes an immediate snacking absolutely necessary. For Wasabi fans, they just love it when the sharp wasabi, is perceived differently than Chili. The Wasabi sharpness in the mouth increases directly in the nose. There the Japanese horseradish makes a special ecstatic feeling loved by the Wasabi fans. Our WASABI PEANUTS are a definite addictive. The best peanuts that are hidden inside the crisp, sharp shall and the wonderfully spicy-spicy exterior, we offer you an incomparable sensual Wasabi snack-class experience. At first is crispy, then warmly sharp, then sweetish and finally nutty. On the way to the interior of our WASABI PEANUTS, you put a small marathon of sensations behind you. The glorious pungency of wasabi, the way into your respiratory system carves and you finally reconcile when you taste the subtle, almost sweet peanut on your palate and your tongue. A fulfillment of a unique style. The taste and visually, make our WASABI PEANUTS fun for you if you value appearances and a crispy, sharp taste. This snack is best enjoyed all by yourself. Here nothing is shared and gave away. Unless you want to end up with an empty package - and who wants to see this crown of creation snacked already?